Los Angeles Mayor Eric Garcetti wrapped up a trade mission to Asia with stops in Vietnam and Hong Kong – for meetings with high-level government officials and business leaders focused on stimulating economic growth in Los Angeles, bringing jobs back to local markets and building stronger ties with the city’s leading trade partners. In Hanoi, Garcetti met with Vietnam Prime Minister Nguyen Xuan Phuc, where talks focused on trade, tourism, and people-to-people ties. Garcetti also noted that advancing human rights is an important goal for the United States. In Ho Chi Minh City, the mayor was on hand for the signing of two memorandums of understanding designed to boost innovation and economic development in both L.A. and Vietnam. The Los Angeles Cleantech Incubator agreed to work with the Saigon Hi-Tech Park on growing their portfolio companies and accelerating sustainable technologies. 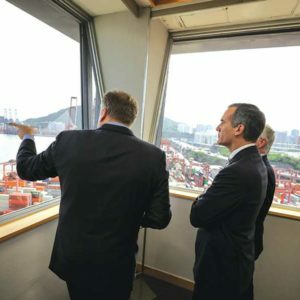 Garcetti worked to boost business between companies in L.A. and Hong Kong. To that end, Garcetti witnessed the signing of an MOU between the World Trade Center Los Angeles and the Hong Kong Trade Development Council to exchange information and support business cooperation between the two cities. The Hong Kong council is launching a year-long promotional campaign in L.A. before sending a delegation to Los Angeles in September 2019. The mayor began the 10-day trade mission with stops in Japan and South Korea, where a series of meetings delivered agreements on bioenergy, tourism, and ports; new investments in downtown L.A.; a partnership on crisis management for disasters; and cooperation on sustainability, resilience, and planning for the 2028 Olympic and Paralympic Games in Los Angeles.